Ok, not really. But it certainly looks like it!! Such a mess!!! The mini album in the middle is turned over so you can not see what it looks like. Sorry. It is a Design Team Project for Genuinely Jane Studios. Check out their Facebook page at the link. They are a great company that will have their new website and catalog go live by the 1st of March. I was asked to be on their 2013 Design Team and am having a blast with them. Great quality, handmade, made in the USA wood mini albums. I will add a blog post about the album after it is revealed at GJS. So, what is WOYWW? Well, it stands for What Is On Your Workdesk Wednesday. It is a weekly blog hop hosted by our fearless leader Julia. Simply, it is just a nice way for people around the world to nose around and see what everyone is up to in their studios. Check out her blog for the current participants and how you can get involved in the future. I wanted to quickly share the canvas I started 2 weeks ago. (My WOYWW buddies saw it just white) This canvas was started for a friend. Her dear husband had an accident and they have both been dealing with his Traumatic Brain Injury since the accident. The moment I found out about his accident, I started this canvas for them. I have sent her pictures of the canvas and we plan to get together soon so I can give it to her. I ask that anyone who reads this to please keep Doug and Karol in your thoughts and prayers. They have a long hard journey ahead of them and the more people lifting them up the better. What a busy desk. Love your canvas, I will keep your friends in my prayers. I love that canvas! It looks so dimensional! I just wanna touch it. :D I do hope your friends are recovering quickly. Thank you for sharing! So sorry to hear about your friends accident - this canvas will bring great hope for the future. Will keep them in my thoughts. The canvas turned out wonderful. So jealous of painters. Sorry to hear the reason it is for tho. Looks like you're busy creating so always a plus. Happy WOYWW! What a beautify canvas and what a beautiful friend you are. Will keep them in prayer. Thanks for visiting me earlier, have a good day/week. I love your desk in all its glory nothing like leaving it out there for all to see. Seriously I do love it. I will pray for your friends...him for healing and her for strength to help her through this tough journey. Such a lovely gift to your friends who are both on a very tough road right now - sending positive thoughts. 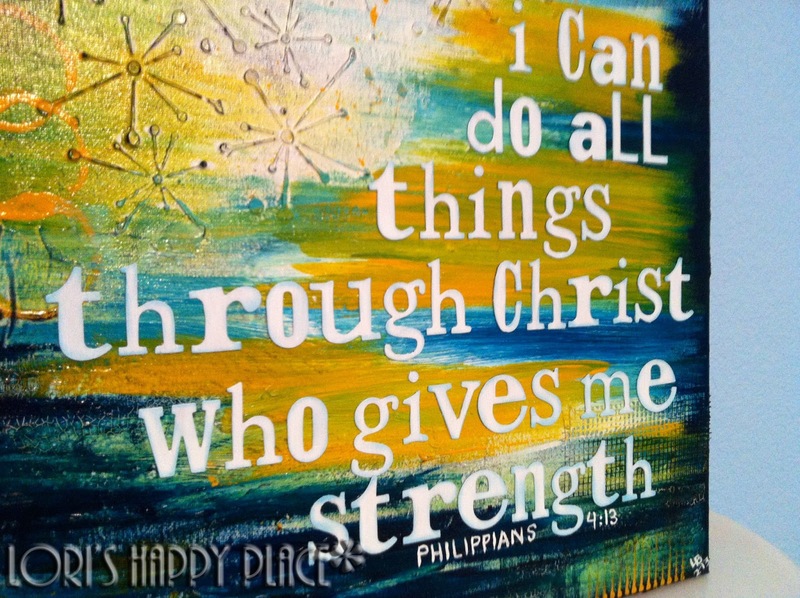 Hi Lori, A cluttered desk always invites a good snoop...LOL Yes prayers are being said for you friends, what a terrible thing to go through, but your beautiful canvas should lift thier spirts a little. I love such explosions - I am sending good thoughts through the air for your friends. Busy desk and a beautiful canvas, very uplifting. Hope your fiend makes a full recovery. It is possible as an in-law of my StepD was similarly injured in a road accident and recovered, slow progress but he got there. oh wow what a beautiful canvas and even more so because of who you are giving it to. I will keept them in my thoughts and prayers for you. While everyone's thoughts will be with Douglas who has suffered tremendously, I have to say we need to give extra strength to Karol. I speak as someone whose husband underwent surprise and very detailed heart surgery out of the blue. This was five years ago and I had to keep our teenage sons' spirits up and the house going and help my husband. It was a hard few months for me...so my heart goes out o your friend. Your canvas is just GORGEOUS!! 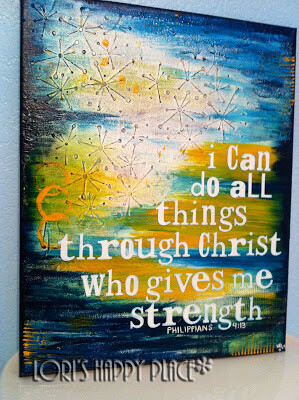 I love that Scripture verse! Will say a prayer for your friend and her hubby. Happy WOYWW! That is a beautiful canvas and the sentiment is great! Hoping your friends find the strength they need. Also love that mini album! Thanks for stopping by. Your canvas is gorgeous. I will add them to my prayer list. In a minute a life can change and affect many, many people. Just a sad thing. Happy WOYWW, take time to ponder for yourself too. your canvas is gorgeous and hopefully will inspire your friends to get through their troubles. I'm sure your friends will love their canvas. What a very special friend you are; so thoughtful. I'm of the mind that there's no such thing as a messy desk. Really. It's just creativity spilling over! i'm dropping by to say hi and thank you for visiting me! what a wonderful way to encourage your friends. yes i will say a prayer for them and claim this verse for the challenges they face. I'm not gonna lie, Lori, it's true that desk is a mess! But you get a pass since you've better things to do like this wonderful canvas for your friends and the care and love you extend to them. I'm sorry for his awful injury and have sent up a prayer. what a great inspirational piece for your friend. What a great gift. You are a good friend. 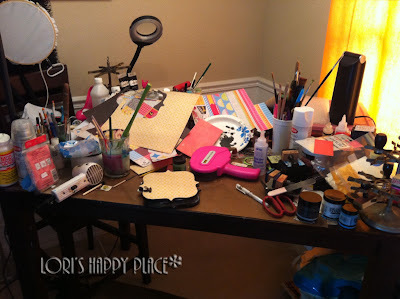 I find the best stuff in a mess like this Lori! amazing what you can unearth!!! Happy WOYWW!